After the glut of products launched yesterday by Asus (including a Surface 3 competitor and a potential iMac alternative), the Taiwanese company has debuted a laptop that looks a lot like the MacBook Air. The EeeBook E403SA costs only a fraction of Apple's ultra-thin laptop at $299 (around £200, AU$390) and comes with a bigger 14-inch display, a choice of Intel Pentium processors, 2GB of RAM, 32GB internal storage and weighs just over three pounds. 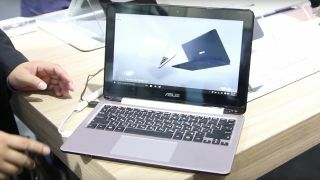 Asus says that the Windows-powered laptop, which is likely to take on Chromebooks, can play up to 13 hours' worth of video, which is pretty impressive especially with Wi-Fi on. Lenovo's Yoga range also gets a nudge from Asus as the latter showcased the Transformer Book Flip, the TP200. The laptop has a 360-degre hinge, Braswell-based Pentium processors and will come with Windows 10 when it launches later this year It will come with an 11.6-inch display, USB 3.1 Type C and up to eight-hour battery life. A third laptop worthy of interest is the EeeBook E202 which is similar to the TP200 without the touchscreen capability. It runs on the Pentium N3700, a 6W-rated quad-core CPU clocked at 1.6GHz. There's a 11.6-inch HD display, 4GB of RAM, a 500GB hard disk drive, 802.11ac Wi-Fi, USB-C, USB 3.0, USB 2.0 as well as Windows 10.